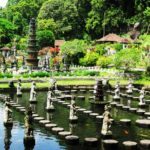 Tirta Gangga is a former royal palace located in the eastern part of Bali Island, Indonesia, located near Ababi village near Mount Agung, about 6 kilometers north of the town of Amlapura, at a distance of 83 km from Denpasar. 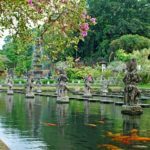 The park is famous for its water palace, owned by the Kingdom of Karangasem. 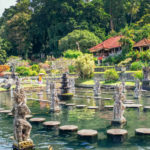 Tirta Gangga is a convenient stopover along tour itineraries to Bali’s eastern region. Its main entrance and large parking area are easily spotted from the main Amlapura Road. The site is open to the public and a small entrance fee applies which goes towards maintenance. 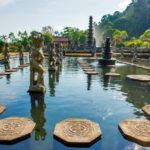 The former royal palace of Tirta Gangga, means that the water in the Palace came from the Gangga River as the Hindu holy river has tiered fountains, tropical gardens, and carvings of mystical creatures that spout water into bathing pools. Just outside the palace area, the lush rice paddies in the northeast of Bali are very stunning. 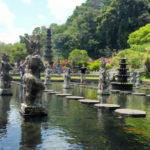 The history of Tirta Gangga Water Palace refers to the water palace built in 1948 by The King of Karangasem, Anak Agung Anglurah Ketut Karangasem Agung. However, this name is also used to refer to the area that includes the water palace along with the lush surrounding countryside. 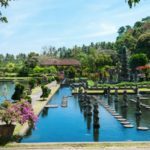 Tirta Gangga Water Castle is a pool of mazes and fountains surrounded by lush gardens and statues. This one-hectare complex was built in 1946 by the late King of Karangasem but was almost completely destroyed by the eruption of Mount Agung in 1963. Then rebuilt and restored. The area around Tirta Gangga is famous for its rice terraces. It is a favorite retreat and some weekends may seem a bit crowded. Besides the many small warung stalls outside of the main site and around the parking area, Tirta Gangga also boasts accommodation facilities and a restaurant, as well as the Tirta Ayu Hotel & Restaurant – located just behind the main fountain. The scenery of Tirta Gangga Water Palace is beautiful with breathtaking views surrounded and the climate is relatively cool. Tirta Gangga Water Palace offers a unique mix of Balinese and Chinese architecture. The grounds of the water garden (ca 1.2 ha), consists of three separate complexes each with ponds and many sculptures. The complex on the lowest level has two large ponds and a water tower. At the second complex (middle level) are the swimming pools. The second level houses the main complex with the country home of the former King. A reservoir on the grounds receives the spring water and delivered by a pipe system to the town of Amlapura. There is also an underground pipe system which leads to the upper swimming pool, where it emerges through the mouth of a giant (a demon statue) that stands at a corner of the pool. Here the water flows over into a lower level pool. From this lower level pool, it flows into some small fish ponds and from there into the rice fields that border the gardens. 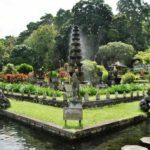 The water of Tirta Gangga Water Palace has always been regarded as holy and is regularly used for religious temple ceremonies. With important celebration days, Tirta Gangga Water Palace is the destination of colorful processions with offerings, umbrellas, flags and other tributes. Led by the local temple priests, ceremonies are held at the spring, accompanied by chanting and the music of the ‘Baleganjur’, a gamelan gong group of small Gongs with each musician striking a specific, different note on the musical scale, all blending in harmony.